Connector to cable UHV ribbon cable assemblies are fitted with female PEEK Mil-C-26482 type 19 pin connectors at one end and non-terminated Kapton® insulated ribbon cable at the other. The female connectors mate directly onto the vacuum side of the MIL-C-24682 feedthroughs. It is locked into place with a single captured retaining screw. 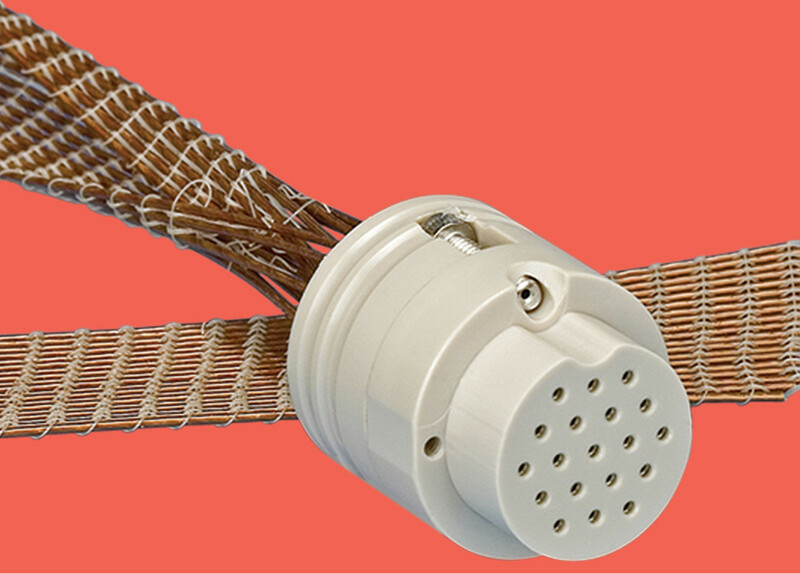 The ribbon cable consists of 19 conductors with a PEEK monofilament outer weave. The indivividual conductors are 28AWG silver plated copper conductors, stranded 7 x 0.127mm with Kapton® insulation. • PEEK connector with locking screws. Cable  :  28AWG silver plated copper conductors, stranded 7 x 0.127mm with Kapton® insulation.